Hansmar - nice mountain experiment. The HDRI does give negative light and specular: HDRI Effect (that's what is called Diffuse for light sources) has a range of -999 to +999; Specularity has a range of -1000 to +1000. However, any HDRI without very bright light sources cannot produce specular, gloss always needs a relatively small bright light source. There is no gloss on an overcast day, only when the sun shines. Dave - your fairy renders look very nice. A had wondered about the spidernet. Good to know it was added in post. Photo-based materials look good, too. Horo: Thanks. That was one I did not check, apparently (HDRI Effect). Have to see whether it is useful. And of course, you are right about the specular. Dave: I did not see anything 'non-leafy' in the other leaves. Probably due to the form and position in relation to the light. Your last render looks wonderful! And the textures look good too; I'll check them out. Early this morning I set this scene up nd left it rendering while I went on to the office... A very simple scene (1 terrain, 2 Symlat and one raven). Light comes from Bryce sun with fill in from one of Horo's Sunless Skies HDRI's. It's a quite big render and benefits from clicking to see the full size. Dave Savage: Wonderful render. Somewhere in the area around Death Value, I think. For this render I used a terrain that was in a series of 'unreal terrains' by ModuleOne (aka Brian Damkjer) at Renderosity. This particular terrain is probably made from a flower. He also made water erosion terrains. I decided to use this one as a kind of volcano and added a number of my earlier metaball creatures (chess pieces, acc. to Horo) at the rim. No specific light tricks in this one, except for a red sphere light which leads to the red spots on the inside rim. I changed the colour of the lights in the 'chess pieces' to better fit the scene. 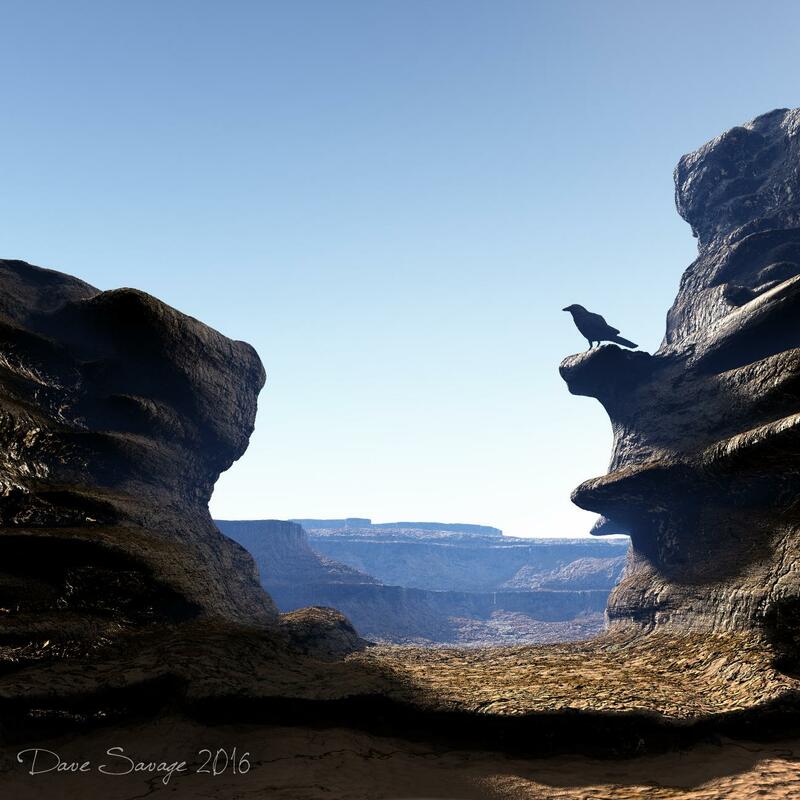 Dave - beautiful landscape with the raven. Thanks for the DTE screen shot of the mud cracks, which I know from the TE but never had the need to do such in the DTE. I used it below. Hansmar - interesting terrain and the lit figures look good. Below an experiment (left) with IB light and a bit of sun with transparency, blurred reflections and anisotropy. At right, another try of a clay render, TA and just using the HDRI as backdrop but with no light. It's the Happy Buddha from the Stanford Scanning Library. Electro-Elvis – thanks for your comment. Funny render the one with the blanket, the indoor renders are awesome, I like both. SRay – nice Mars scene. C-ram – another outstanding render, love it. Lots of things to experiment with from Haze to Clay renders to negative lights, and Dave’s materials. Bryce 7 Pro. Render Premium TA 16 rpp. Lighting: sun and Sphere Dome Light. Bryce 7 Pro. Render Premium (soft shadows) 16 rpp, time 2:02:12. Lighting: sun, Radial Light, Spotlights, Sphere Dome Light. The ruins of the old castle. Bryce 7 Pro, Wings 3D. Render Premium (soft shadows), 16 rpp. Lighting: the sun (shadows of clouds included), Sphere Dome Light, Spotlight. Mermaid - thank you. 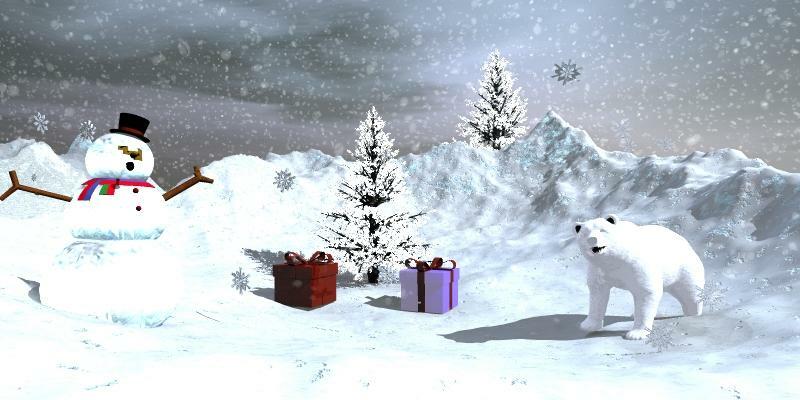 Lovely winter scene. Looking at the overcast sky and the snowflakes, I think the sun light is a bit on the bright side. Slepalex - Mountain trail is a very beautiful render, definitely my favourite of the three. Night before Christmas is a very nice and elaborate scene. Less spectacular but with the flat light of the moon, it looks quite natural to me. The ruins of the old castle is a great scene. 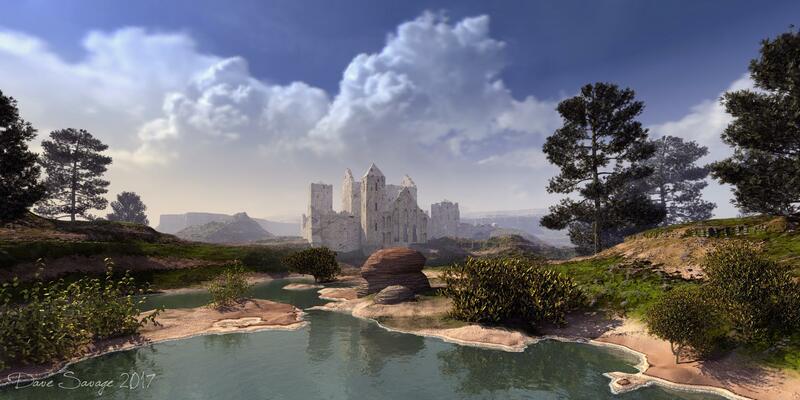 The ruin looks great and believable and the landscape surrounding it is excellent. Horo: The buddha looks strange in the first one. Very nice light experiments. And thanks for the nice comments. mermaid010: Thanks so much. Very nice winter scene. But a bit too much light in the bottom half, I think. Slepalex: Great scenes, wonderfully rendered. There is much to love in each of them. Ruin scene is my favourite! Horo - Thanks for sharing your knowledge. Lighting and me are not very good friends. I'll have to read your pdf to see if I can understand it a bit. Also good result using the haze for your glass corridor. 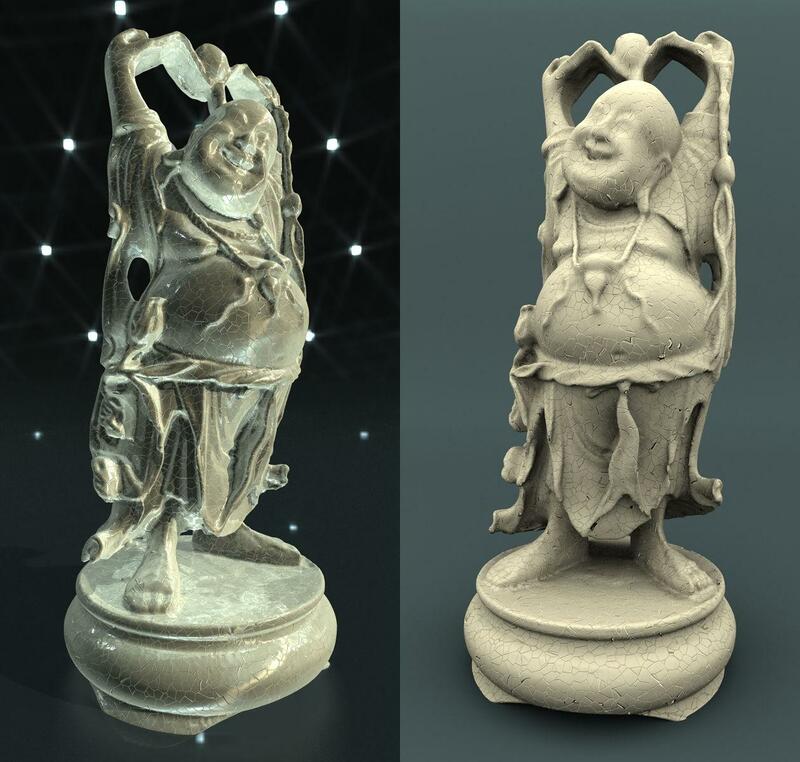 Now for the buddha, interesting experiment, the one on the left looks like the clay has been exposed to the sun too long, but I do really like the one on the right. Dave - Loooove fairies. I can never get enough of looking at them. They are all great. Also thanks for the free textures. And the scene with the raven looks wonderful. Electro-Elvis - Good choice of using haze. I think it looks better than the one without. It has a more realistic feel to it. Hansmar - Interesting experiment on lighting your precious stones. And great difference on the 2 terrains, the second one seems to be alive. S Ray - Well done on your armor modelling. C - ram - You might call it unfinished. I would call it beautiful work... But I would expect anything else coming from you. Look forward to your 2017 masterpieces. mermaid - Lovely winter scene. I like the snowflakes. Slepalex - Wonderful scenes. Not sure which one I prefer, its a toss up between the mountain path and the ruins. After admiring the way C-ram does his pavers, I asked for his help and he was very accommodating with instructions and altogether help...Thanks so much Marco. So this is my version. Not as good mind you. But still better than if I had no direction. Thank you all for your comments, finally I like my desert scene. It seem that I'm not confortable when comes the time to give a try about unpopulate renders. @Hansmar : nice shoots, I like your work about mountain and negative light! @Dave : nice fairy picture, you've really got a good style. Also, your little canyon render is awesome! @Alexey : wonderful painted style renders.. we could shake hands when comes the time to talk about landscape. And Vivien : you're most welcome! You've really improved your render and I think you're on the right way! Never forget that a realistic picture must have a lot of details. Most of time I observe nature to get my inspiration. Sometime I could take a walk on a little path in a forest and then stop myself during minutes to take a look at the vegetation surrounding me. By the past, Mermaid join me because she want me to send her one of my file to take a look about the way I'm using Bryce. I could also send you one, just P.M me and it will be with pleasure. Inspired on by Alex and C-Ram's excellent landscapes, I've been playing today... Hate when you finish a render and only then realise you've left some roots above ground... Oh well, I'll re-render it now. It pulls on the masterpiece, Dave! < "You've left some roots above ground ..."> This is also my happens very often. You can use partial rendering. You have to fix it definitely! This work is worthy of large format regardless of the render time! The only ... are clouds on a billboard. We immediately see that this photomanipulation! Or take the image (HDRI) high-resolution, or use a volumetric clouds. Thank Alex... The sky is provided by one of Horo's HDRI's from the Sunless Skies set... Not sure what the max reproduction size of these is, but there are no higher resolution ones supplied. Roots fixed and whole thing re-rendered bigger (just a little over 8 hours). Great work Dave! I see what Alex means. The clouds are much more vague than you would expect for a picture where the ruin is still rather sharp, though it is quite some distance away. Looks like the HDRI is not sharp? Or is the haze effecting it too much? Which rendering mode you used? Map HDRI high resolution greatly increases file size. And he (size), and so you have a large, judging by the fact that the used 3ds trees. You can use the Bryce Sky HDRI with the same result lighting. In any case, the picture turned out quite epic. It is very well expressed by the prospect that the enhanced well-tuned haze. Topography and terrain texture is very good. Only unrealistic blurry clouds do not fit into the big picture. Eight hours of rendering - it's baby time! Bryce 7 Pro, Wings 3D. Render Premium 16 rpp. Time 3:38:43. Much time is spent on the creation of a terrain texture, atmosphere and lighting. Anyway, I'm not very happy with the result. Render setting: True Ambience at 36RPP Alex. Yes, I could make HDRI from Bryce sky but as I'm using the HDRI as a backdrop (thus providing the clouds), the only way to go to improve the clouds would be as you mentioned to go down the volumetric cloud route... Then render time would be a few days I suspect. If I get some time, I may try adding an amount of depth of field so the clouds look like they are supposed to be a bit less well defined, but then I'd probably have to go up to 64RPP otherwise the blur of the depth of field will show too grainy... I've already moved on to my next idea now but I might come back to it. Love your lighthouse. Especially the material on the water. The light on the foreground terrain is maybe a bit flat and you're getting that annoying straight line between the lit side and the dark side of the lighthouse column (I sometimes find that reducing the bump to a minimal amount solves that). Thanks Hansmar: No it's not the haze, it's set too low to affect the top part of the clouds. Vivien - thank you. Great use of c-ram's pavers. Slepalex - nice Lighthouse image. I'm not sure I like the haze but the water is excellent. The observations about the sky in Dave's great render are a bit overdone. First I like to see a billboard made with a 16.2 mm rectlinear lens that has no distortions left and right. Clouds in nature are seldom as sharp as Bryce can render volumetrics. Cumulus clouds can reach up to 12,000 m (36,000 ft) and between the observer and the cloud is usually some air with moisture in it. Such air makes the air less transparent and the air molecules stray light and make objects in the distance fuzzy. Below the sky used by Dave in the same render size (click on image to open full 1666 px wide) and with the same camera FOV (equivalent to a horizontal FOV of 96°) and the same orientation. The HDRI panorama was made from 49 24 Mpx photographs. On top, the render with the original panorama, below the one half as big, third the one Dave used and at the botton the smallest one I made. There is a difference of sharpness between the one that supplies nearly 3 pixel for 1 rendered pixel to the one Dave used that gives half a pixel for 1 rendered pixel. I find the difference is quite small and could even be attributed to the atmosphere. It looks natural to me. Dave. You can have two options. 1. Take low resolution HDRI and use it only to illuminate the scene. On the background set the billboard (2D Face) with clouds photo. The billboard material uncheck "cast a shadow" and insert the image into the field "Diffuse" and "Ambient". Exclude in the Sky Lab 2D Face of lighting. The material 2D Face set parameter Diffusion=100 and Ambience as you like (not zero). If you do not use HDRI as a background, then why do you need an external map high resolution? She still does not give high quality cloud images, but greatly increases the file size and memory! Use Bryce Sky HDRI low resolution. If you apply for the lighting HDRI, we must abandon the render with TA. Just Premium, without TA. Horo, this is all theoretical assumptions. The practice says another. If the castle is at a distance of 2 km looks sharp, the clouds should look sharp. Your example only proves that the map HDRI high-resolution still has pixelation. Just look at the photo on the Internet. When imaging is only 1/6 of the image used as the background (camera angle 60 °). If the width of the output image is 1920 pixels, the HDRI background should have a width of 1920 * 6 * 2 = 23040. What should be the weight of the file? Last I used in this work. I made a quick especially for this theme. File size 10.3 Mb without clouds, with clouds 14.6 MB. Image size 4288x2888 pixels. You could take half. Lighting: Sphere Dome Light and sun. Render time 1:30:24. Horo, that you think is wrong with the haze? Dave, the foreground is illuminated only with Sphere Dome Light. Direct sunlight is not available, because it included the shadows of the clouds. That is, the foreground is lit as in cloudy weather. Lighthouse itself, as well as the distant mountains, is in addition lit with narrowly directed light source (Spotlight), that simulates a ray of sunlight filtering through the clouds. "You're getting that annoying straight line between the lit side and the dark side of the lighthouse column (I sometimes find that reducing the bump to a minimal amount solves that)"
This sharp line really depends on the "bump"! This is especially noticeable in the bitmap texture. In the case of a still life I'm using multiple light sources to cover this drawback. Here the sun (in this case Spotlight) shines on the right. It is clearly visible boundary lit and unlit parts of polygons. If you do not use an additional light source (in this case, Sphere Dome Light), the unlit side will be just black (at Ambience = 0). Here is an example. Left bump = -60, right bump = -5. Truth lost the right relief texture. In any case, a useful observation! Slepalex - thank you for your comments. If a castle in 2 km distance is sharp, so the clouds in 12 km altitude must be sharp too, no matter how the atmosphere is vertically layered? My examples are not theoretical but practical, I made the photographs, I was there, I know how it looked. Your billboard example is beautiful but I was not there and can therefore not know whether it is realistic or was artistically enhanced. The image size of 4288 x 2888 pixels is 35.4 MB the file size 10.3 MB shows that the file is compressed by a factor of about 3. Likewise, the Bryce file size does not tell you anything about the memory usage because it is compressed. If you do not have a dedicated program that shows you the memory usage of Bryce only, you can use the Windows Task Manager. Keep in mind that Bryce camera FOV at Scale 100 is the diagonal of a document with an aspect ratio 4:3. If you want to know the real horizontal field of view you have to calculate it. My example renders above have a horizontal angle of view of 96°, which is 0.2667 (about 1/4) of a full circle. Whether you really need 2 pixels to be rendered as 1 pixel I do not know because I do not know how the two render engines in Bryce work. However, the top render uses an HDRI that has 2.57 px for 1 pixel rendered, the second about 1 px per 1 px and it is a tad less sharp, but I do not see any pixelation. Please note that the image is shown 800 px wide (down-sized by the forum software here), you have to open it to see it it full 1666 px width (jpg 95% quality). I find it very difficult to judge if a weather phenomenon shown in any artwork or image is real or not. I am always amazed what nature can produce. Nothing is wrong with the haze in your Lighthouse render, I'm just not sure what it is I see on the far left mountain above the snow line. Horo, without going into the technical details. Yes, the file is compressed being saved. In memory 4288x2888 file takes a lot of space. But! 1024x1024 picture size as the billboard looks a lot better than your highest HDRI. Your thumbnail much talk about it. Yes, I have opened your image in a new window in full. Still visible pixelation or too compressed file. Proof - render Dave (1666x832)! Clouds are blurred! My picture is 1728x1080. Clouds sharp! 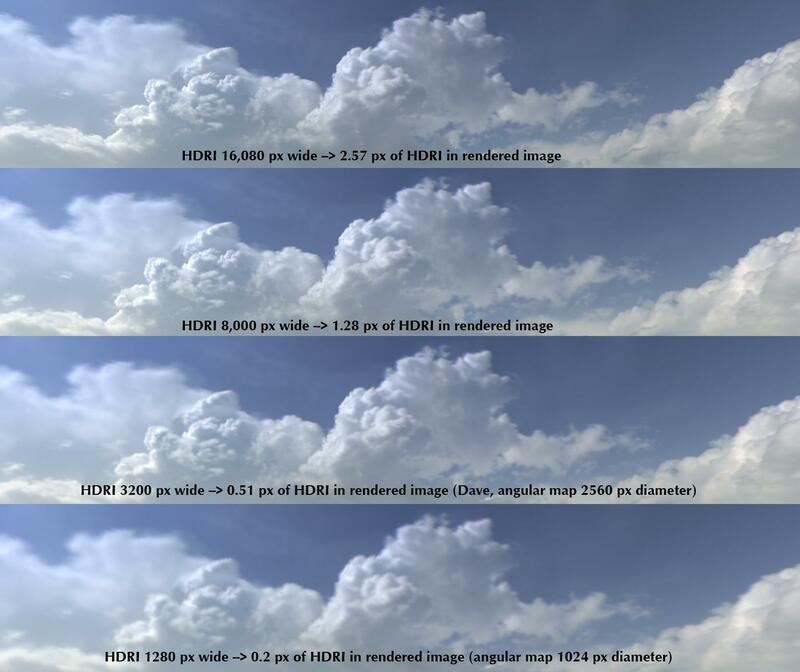 Take two pictures with HDRI images from clouds and from the billboard and compare quality, file size and memory space! Then make render volumetric clouds in the manner which I have described in reply to Dave and compare the quality and the disk space and memory! And yes, your viewing angle of 96 ° gives a blurred image. What then to speak about the angle of 60 °? It's 1/6 of a circle instead of 1/4! Hence, the quality will be even lower! Slepalex - sorry, I think we are not talking about the same. No problem. So if I'm understanding the issue at hand is the level of blurring of the clouds? And whether that blurring is caused by atmospheric effects or by compression of the image? While that question is of interest to me, the main issue in my view is the total mismatch between the blurring of the Hdri and the sharpness of the rendered content in many of our HDRI background included renders, regardless of the actual resolution of the backdrop. The standard assumption with an HDRI is that the HDRI is not in any way the focus of the final image, but that there is some target object that is expected to be rendered with a fair degree of sharpness. The background by contrast being less important, is assumed to be blurred. When an hdri is being used on a very small target object like a single car, or a chair, toy, plate of food, or something like that, it is easy enough to reconcile the blurred background with the sharp target. But when Hdri are used for full landscapes that have both foreground and midground information, it can be much harder to weave an HDRI backdrop with a fixed amount of blurring seamlessly into the scene. This is where I can agree with SlepALex, in that the Dome and Fill lights do a more natural job of providing sufficient light from all sides as well as allowing for lots of control in the light lab compared to an HDRI. But the benefit of an Hdri is that you dont have to waste the years rendering clouds directly in Bryce. If nothing else, the HDRI can be a major time saver even if they are tricky to set up visually. Attending to this mismatch of sharpness can send us down several roads. Considering how rarely we use DOF in Bryce, extremely high resolution HDRI are often more important than in other applications where DOF is faster to render. The mismatch can be solved either way, by increasing the sharpness of the HDRi or by finding ways of blurring the rendered content. With small taget object, its much easier. But with landscapes, not so much. Again, I think Bryce, due to its limitations, tends to encourage us to lean toward higher resolution backdrops so we can avoid neededing to employ DOF to average the foreground into the background seamlessly. On the issue of atmospheric effects causing blurring. I always assumed unconsciously that there was a certain amout of attenuation of sunlight due to atmospheric turbidity, and that it should affect the appearance of items such as clouds as well. Making them dimmer, and but also more blurred... that is when viewed without some sort of corrective lens. But I'd expect these effects closer to the horizon, not as much in higher altitudes where the sky is much thinner thus providing less air to disperse light. I think the particular case with the high altitude clouds in the cold environment, the atmosphere would be on the thinner side and likely tend toward more sharpness. However, that is not to say the actual sky itself wasnt blurrier in the original photo session as I think it unlikely these sky images were taken in Arctic conditions, most likely the climate near Horo is temperate and closer to sea level, so the air is probably much thicker than it would be if taken in actual mountan conditions. One thing is for sure...we really have come a long way that we are discussing things in this level of detail. Gosh, I miss the days when we did this sort of thing all the time. No, the problem is! If you do not talk about the technical details, but the result, then the problem is! You can compare the results. I just do not have this HDRI. I could make two comparative rendering with a simple picture of the clouds pictures and HDRI-map. In general, I see little sense for experienced users to use as a background HDRI map for Bryce. In Bryce enough opportunities to do without it. 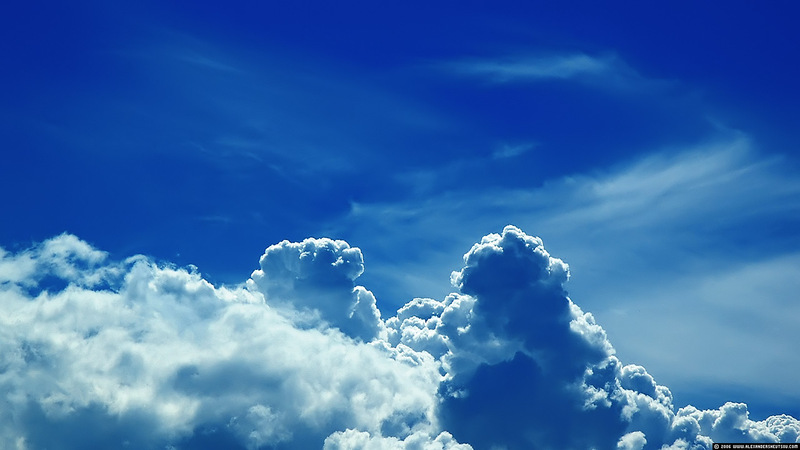 Is the atmosphere, there is procedural clouds, there is a three-dimensional cloud. Another thing DAZ Studio. There's none of that. But when you look at some renderings of naked girls and HDRI as a backdrop, there is a feeling of falsity. It's like that make the background in Photoshop. Less costs and the result is obvious!